Since 1970, Galco has made the most comfortable, versatile and most copied shoulder holster systems in the world. 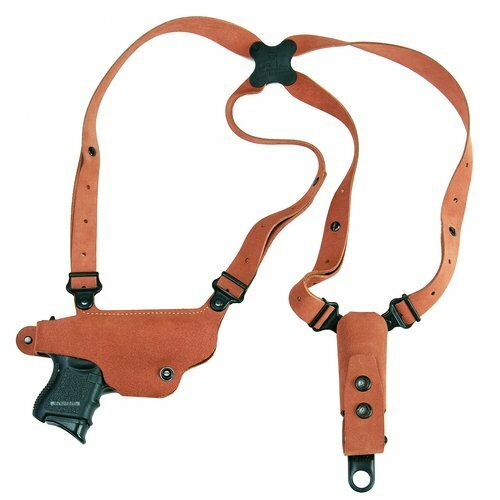 If you want a genuine Galco shoulder holster for part-time carry, the Classic Lite is for you. The Classic Lite gives you all the comfort and versatility of our professional rigs, since we use the same connectors to achieve the same great fit and function, including our trademarked clover shape Flexalon swivel back plate. Using premium Center Cut Steerhide allows us to offer you a very reasonably priced alternative shoulder system with a proven track record. And you thought an ill-fitting nylon rig was the only affordable choice! This system includes holster, harness, ammo carrier and a set of system screws. Like our professional rigs, the Classic Lite is fully modular. Optional accessories and components may be purchased separately. Made for semiautomatic pistols and double-action revolvers, the Classic Lite is available in right and left hand draw in natural-color, premium center cut steerhide.